Can a Construction Site Benefit from HD Security Cameras? HD security cameras at a construction site go a long way to deter criminal activity. When you factor in video analytics and live remote monitoring, the security system can be even more effective. Stealth's construction site security system is programmed with video analytics. Video analytics use algorithms to monitor and analyze large amounts of video. The software automatically detects when there is activity on your property and alerts a trained security operator who can track and follow the movement with outdoor HD security cameras. 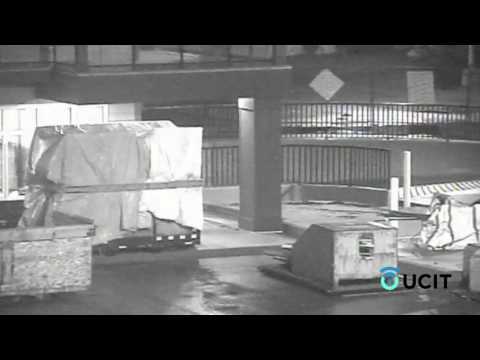 In this video, the suspect attempted to break into a business space under construction. After rummaging through the site, he threw objects against a glass pane, eventually breaking it and gaining access into the building. Unbeknownst to the suspect, construction site security operators had already called local police and continued to watch his activity with HD security cameras. Moments later, the police arrived. A Stealth operator directed them to the trespasser's location, where they made an arrest. A primary benefit of HD security cameras at a construction site is that they can help deter criminal activity. Because vandals and trespassers do not want to be seen or identified, they may avoid a property if they know HD security cameras are in use. However, simply placing unwatched cameras around the premises does little to dissuade some criminals. Live remote video monitoring watches properties in real-time. If an outdoor security operator sees suspicious activity at a construction site, they can activate an on-site speaker warning. If the criminals remain on the property, the surveillance operator can call local authorities. Because the HD security cameras are watched live, this verifies the activity as a crime in progress. Verified calls improve police response times and increase the probability of an arrest, which can decrease the likelihood of property damage and theft.